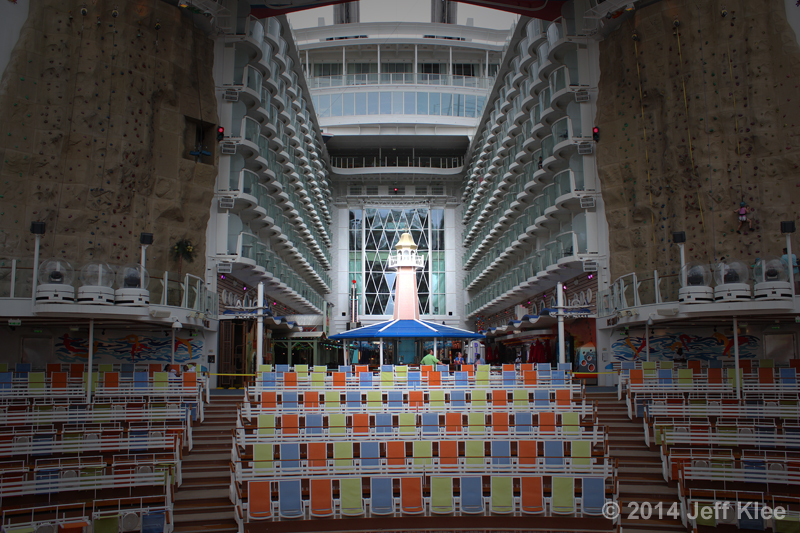 Like most cruise ships today, Royal Caribbean’s Allure of the Seas has many specialty dining options for a nominal fee. The most expensive of the 26 dining venues is the exclusive Chef’s Table at $85 per person. By the end of this review, you’ll hopefully see the bargain in this price and what it brings you. There is only one seating per night, and each seating can only accommodate 16 guests. That means that on each cruise, only 112 of the approximately 6,500 passengers get a chance to attend this unique dining experience. It’s important to lock in your reservation as early as possible if you’re interested in participating. 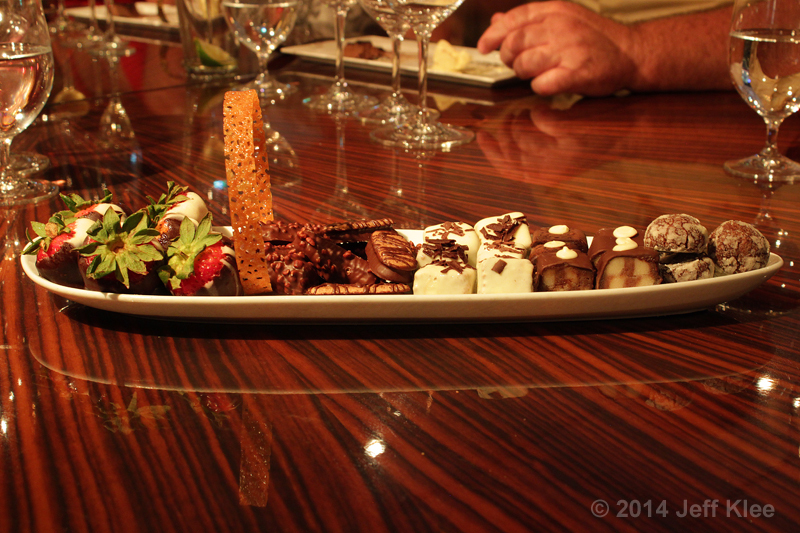 I’ve eaten at Chef’s Table twice, and both experiences were very similar in style, but differed in the food served. The day of your reservation, you’ll receive an invitation in your stateroom that names the guests in your party, along with where and when to meet. On the Allure, the meeting takes place at 7:30 p.m. in the ships library. The staff allow a few minutes for late arrivals before the sommelier arrives with a tray of champagne for everyone. This will be the first of six drinks that will be served throughout the dinner. 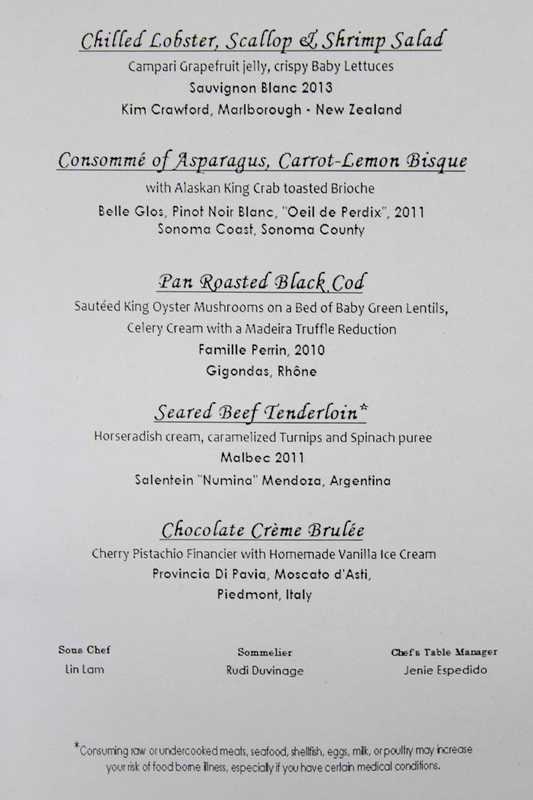 The remaining five will be wines that are part of the pairing to the dinner. After several minutes of mingling with your new-found tablemates, you will be escorted to the Concierge Lounge next door. 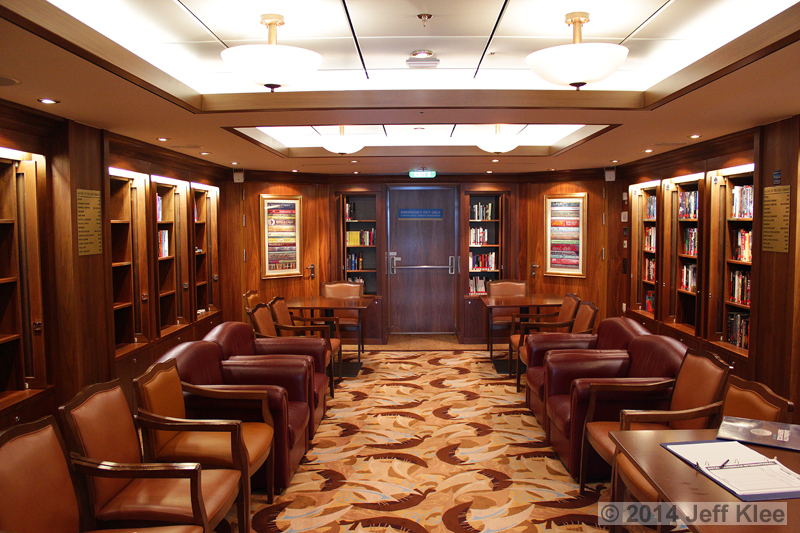 For those not familiar with cruising, the Concierge Lounge on Royal Caribbean ships is reserved for guests of Diamond+ status or above, and for those staying in suites. Since Chef’s Table is open for any guest able to make a reservation, this may be the first (and maybe only) time some folks may have the opportunity to see the inside of this sometimes coveted lounge. Inside the Concierge Lounge, a set of stairs lead the diners to an upper level balcony that has a large table set up for the dinner. The Chef’s Table dinner is a fairly organized event, and as all fourteen of us (two people were unable to make it) arrived at the table, I didn’t want to cause disruption by holding everyone back as I photographed the table and spectacular views outside the ship. Through other points of reference, I can show you where the lounge is located, and what the views are like. Looking forward from the very back of the Aqua Theater, I have highlighted the Concierge Lounge’s triangle shaped windows below, that overlook the entire boardwalk, and onto the ship’s wake beyond. 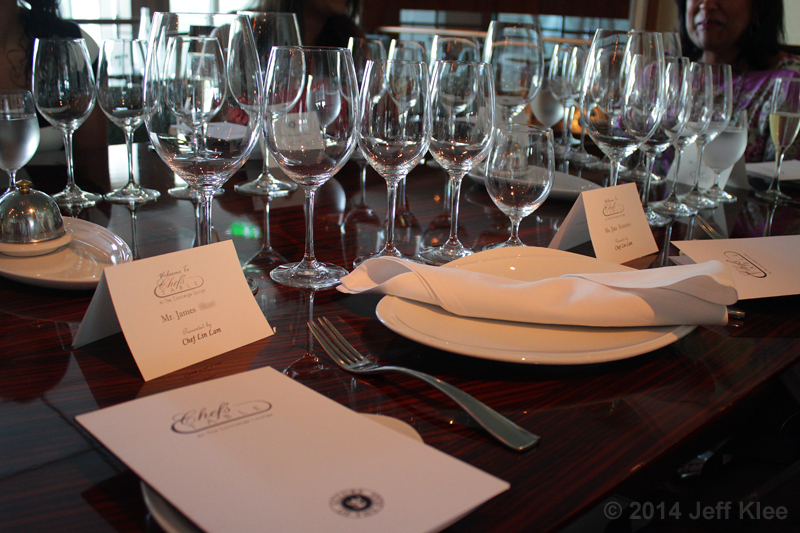 Seating at the table is assigned by the staff prior to the diners entering, and are marked with place cards. The table is positioned so that diners on one side have a beautiful view outside those floor to ceiling windows that overlook the entire aft of the ship. The folks sitting on the other side don’t miss out however, as the wall along the back of the table is covered by a large mirror, giving these diners the same view as those sitting across from them. Couples will be seated next to each other, but I’m unsure of the strategy for seating singles. Initially when you arrive, the table is set for no particular course, but does include the the wine glasses for the first four courses. 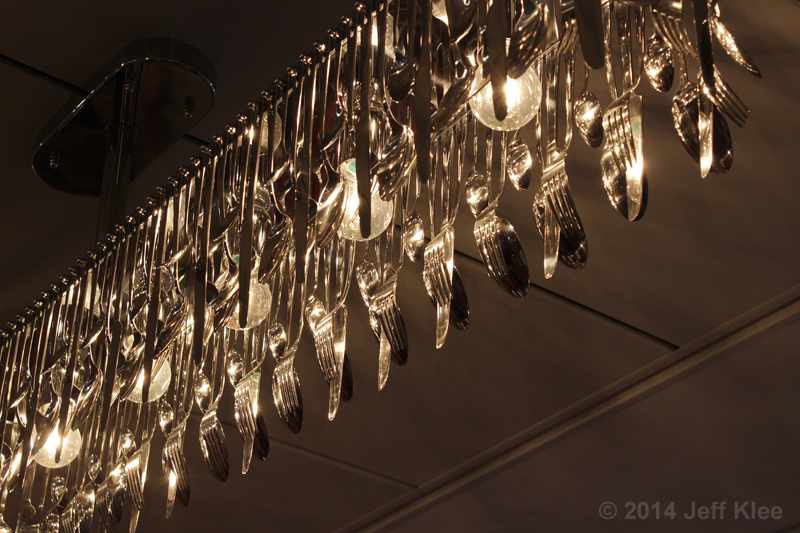 An interesting “chandelier,” made from a full array of silverware stretches down the center of the table. To the right of each place setting, the bread plate has a small pamphlet sitting on it. 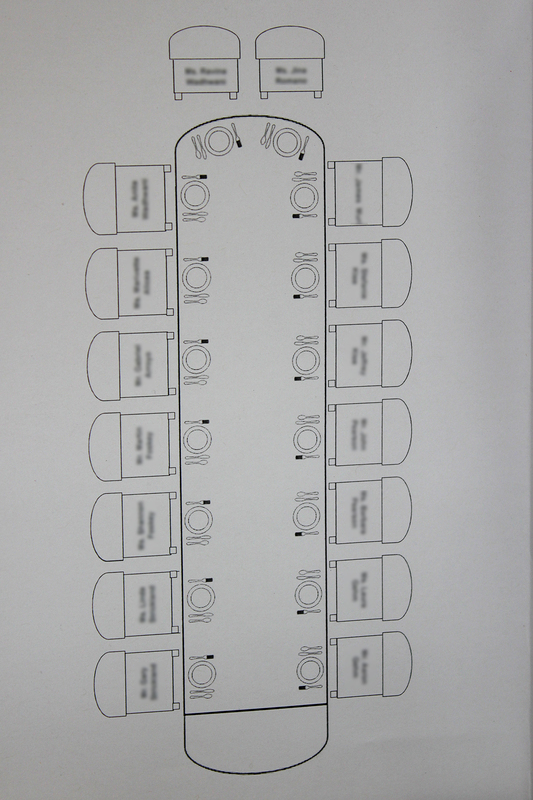 Opening it up, the left side contains a diagram of the table with each diners name and where they are sitting. The right side displays the menu for the night. 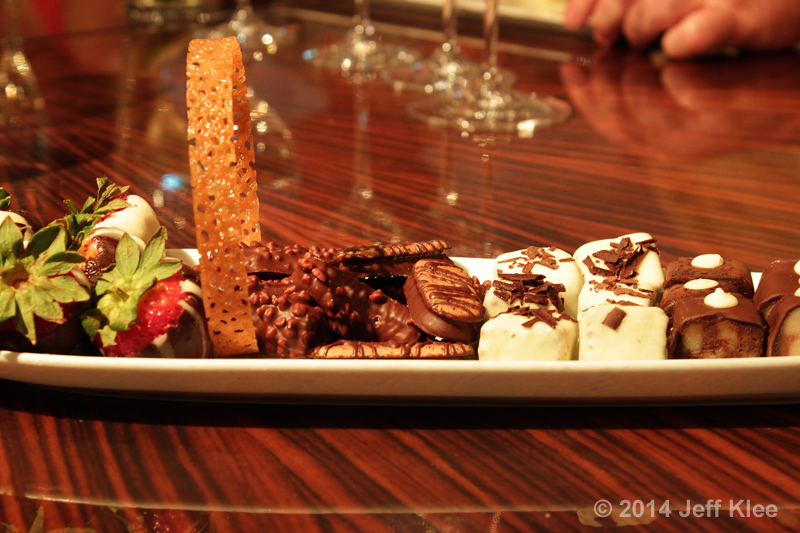 The Chef’s Table meal is a five course tasting menu. If you have food allergies, accommodations can be made, but it’s important you notify Royal Caribbean Dining at least 24 hours prior to your reservation, as it requires some changes the chef has to make to a menu that has already been set for the week. The wine pairing that comes with each course is thoroughly explained in detail by the sommelier. He will name the wine, explain where it comes from and a little history behind it. He will also detail all the tastes the wine will have, from the first taste, to the changes in taste that will form after sampling different foods within that course. I will now take you through the dinner as our group experienced it. 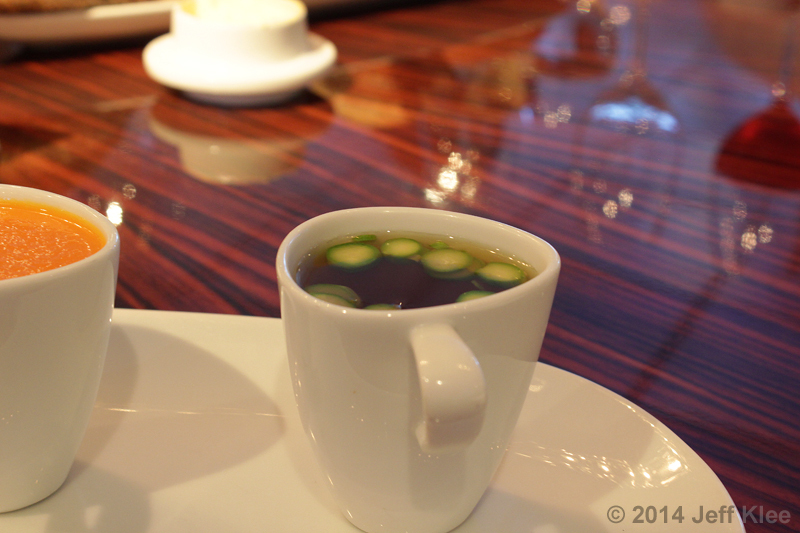 The meal starts with a bread plate as the sommelier and chef are introduced to the group. For those that have eaten at Allure’s 150 Central Park, this is the same bread that you will find there as well. 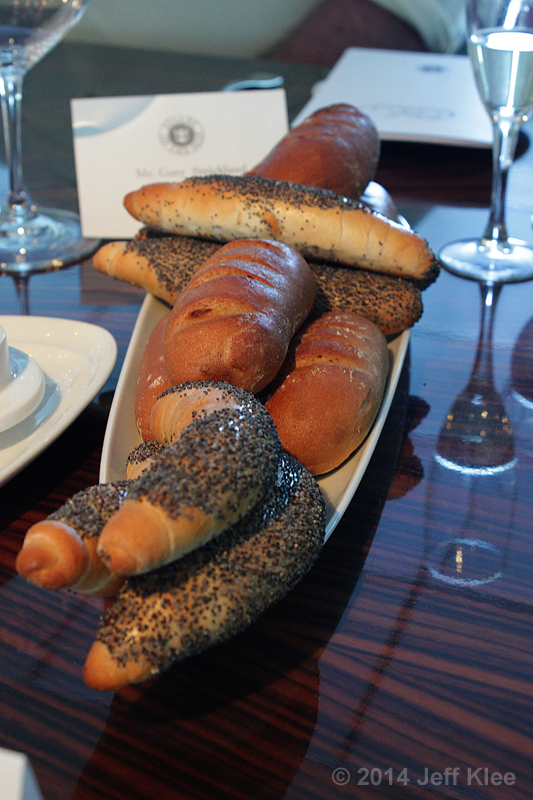 Like all bread served on the ship, they are made daily on board, so they are always fresh and soft. It was time for the main meal to start. Course one was a Chilled Lobster, Scallop, and Shrimp Salad with Campari grapefruit jelly, and crispy baby lettuces. I won’t be discussing the wines and the details of how and why they are paired with each course, but I will name each pairing, as found on the menu. The chilled salad course was paired with a Sauvignon Blanc 2013, from Kim Crawford, Marlborough – New Zealand. 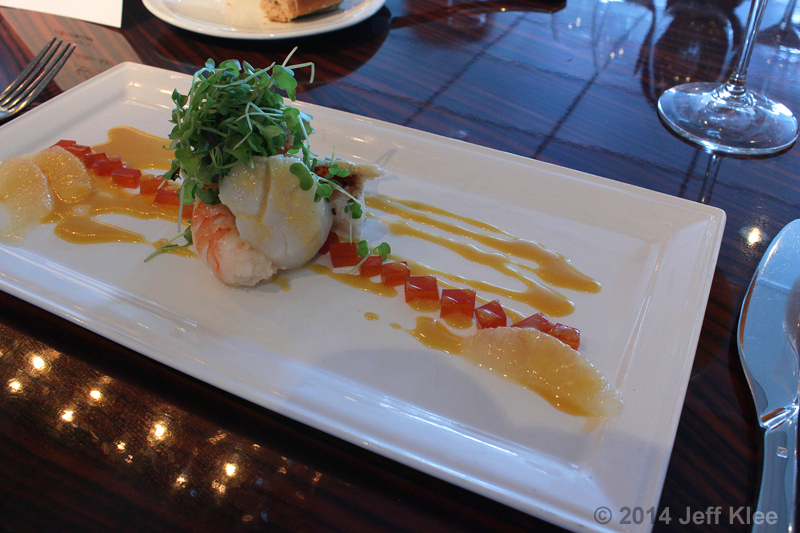 The three pieces of seafood on the plate consisted of lobster, shrimp, and scallop. Each is poached individually in a mixture of vegetable stock, white wine, and white vinegar. This combination keeps the seafood fresh, and adds some flavor as it cooks. The reason for them being cooked separately is to avoid the mixing of flavors. This way when you eat the lobster, you don’t taste any scallops or shrimp, and the same goes with the others. I thought the lobster and scallop were cooked perfectly. I found every part of this dish tasted fresh, including the seafood. This cooking technique obviously works. Seafood is usually brought on board frozen due to the circumstances of cruising, but you would never be able to tell from the taste of this plate. There was a line of grapefruit jelly as they called it, which was actually a gelatin texture we all know as Jello®, that strung across the plate. They were made from fresh grapefruit juice, Campari (an Italian liquer, obtained from the infusion of herbs and fruit in alcohol and water) and gelatin. The dressing that covered the seafood was also grapefruit flavored. It was made from fresh grapefruit juice, sugar, and ginger. These are heated until they are reduced down almost to the point of being caramelized. Then olive oil is added along with white vinegar, and champagne, which brings up the bitterness and sweetness from the fruit juice. These two grapefruit flavored foods were also accompanied by actual slices of grapefruit. There was a lot of citrus on the plate, but the sweet flavored dressing and jelly both added a nice contrasting acidic flavor to the shellfish. I also thought the texture of the gelatin was an interesting combination that went well with the slightly chewier seafood pieces. The “lettuce” as it was named were actually radish sprouts that covered the seafood. These offered the only crispy texture on the plate, and added an overall freshness to the entire dish. This was a great beginning to our dinner. It was nice to start with something light and flavorful, that wouldn’t sit heavy and fill us up before the dinner was over. 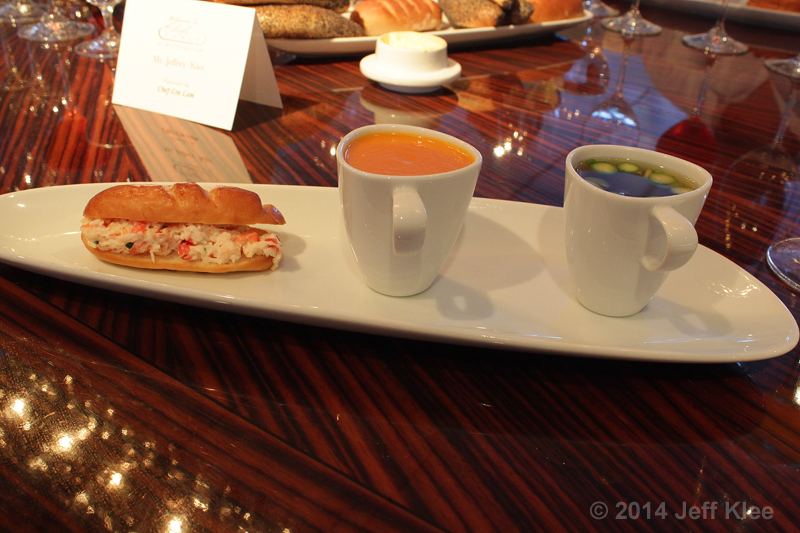 The second course was a Consommé of Asparagus and Carrot-Lemon Bisque, and Alaskan King Crab on Toasted Brioche. This was paired with a Belle Glos, Pinot Noir Blanc, “Oeil de Perdix,” 2001 from Sonoma Coast, Sonoma County. We started with the asparagus consummé, which was made in a vegetable stock, cooked on low heat for two hours until the green color comes to the top. This then turns the asparagus a darker color, and the consommé itself will have a light gold color. After the two hours, it is cooled and egg white is added along with blended asparagus. The egg white will pull the impurities out of the stock, and the blended asparagus will add extra flavor to the liquid. Then it’s heated back up to a low simmer for another 45 minutes until the egg white also comes to the top, leaving just a clean, mostly clear consummé. I found this consummé to be a bit bland myself, however I wasn’t participating in the wine pairing. Supposedly the asparagus worked with the pairing, creating a different flavor to the wine before and after sampling the soup. This is where the wine was an integral part of the meal, and I may have missed an important part of the experience. I just wasn’t feeling up to the large quantities of alcohol that the meal includes. The asparagus itself was semi-soft, and only required a lighter bite in order to chew. That was all there was to the dish, just the asparagus and the broth. The carrot bisque was next up. This soup is made by caramelizing lemon zest with sugar and carrot. It’s caramelized until the carrot turns a little brown, and then vegetable stock is added. The chef lets it boil until it softens up to the point where it can be made into a mousse. Finally, cream is added and the mixture is brought to a low simmer for 25 minutes. This low heat simmer keeps the cream from splitting and the soup stays a nice, thick consistency. I thought this tasted just like a carrot purée. As basic as it looks, it was quite a delightful taste. 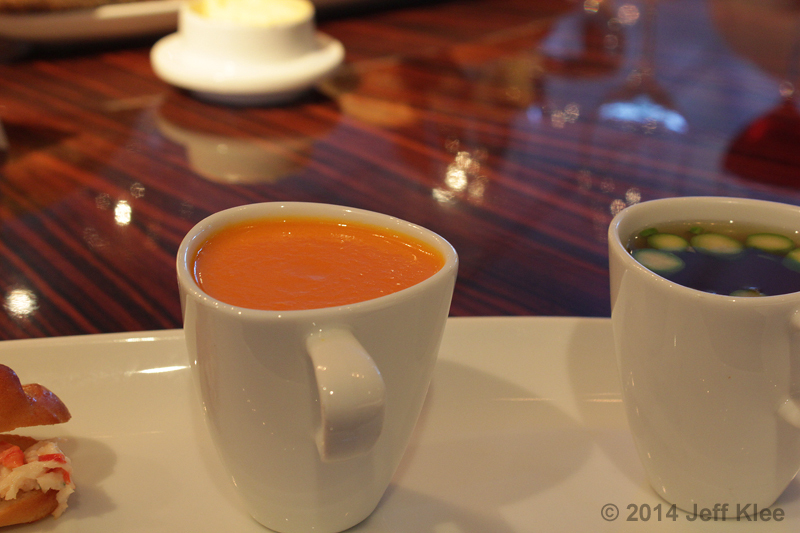 The cup of bisque was very creamy, although still fluid enough to be poured (or in this case, drank). 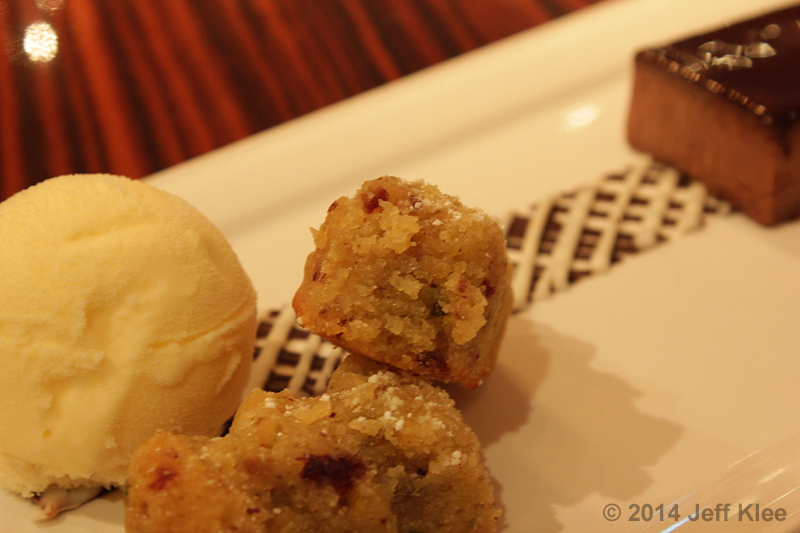 It was naturally sweet, without pushing into the realm of dessert sweetness. I enjoyed this mini-cup much better than the previous one. Things only got better as I moved toward the other end of my plate. 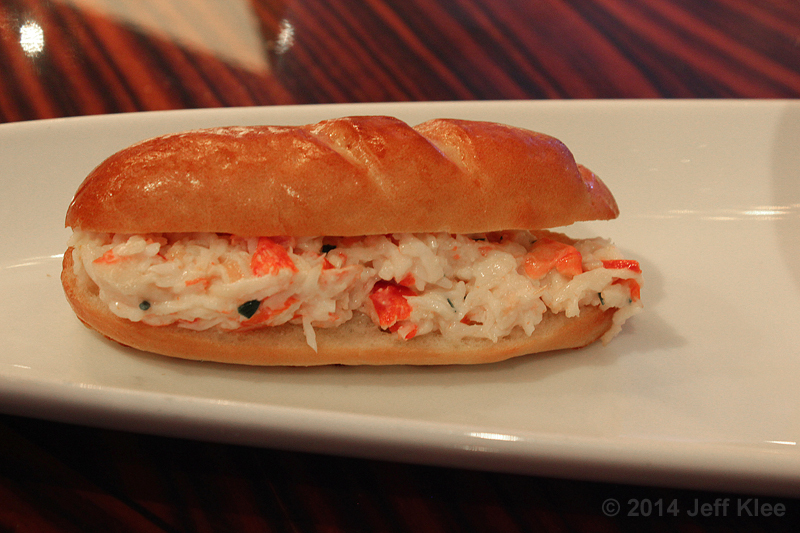 The last item was the Alaskan King Crab on Toasted Brioche. The crab meat is made from King Crab, and a marinade made from an ingredient I didn’t get the name of, along with a juice (type also unheard), and chives. Due to the pace of the chef’s explanations, I didn’t quite hear everything that was said, and didn’t want to interrupt him and disrupt the dinner. This sandwich was simply fantastic. The crab was some of the freshest I think I’ve ever tasted. The flavor was strong, but without being fishy, or artificial tasting. 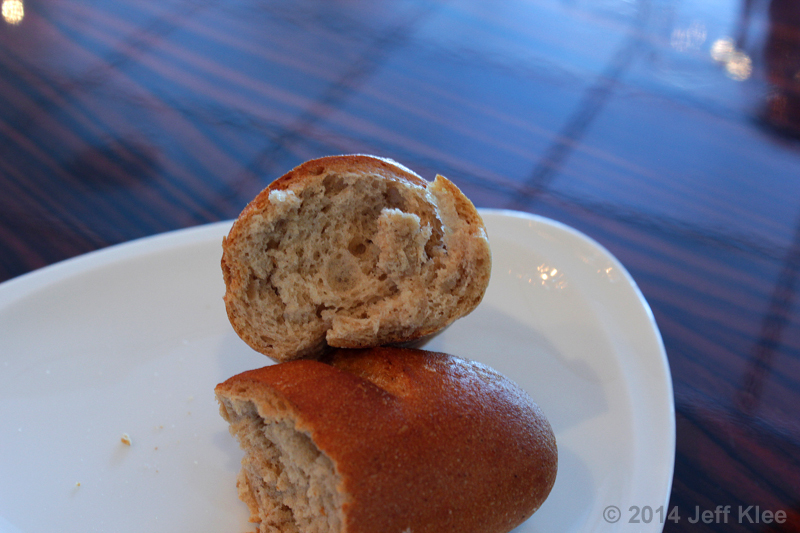 The brioche, while toasted, was overall very soft and buttery. It seemed to be toasted only to the point of being warmed without firming up. The warm brioche against the cold crab was the perfect contrast, and the flavors blended in a harmonious symphony of flavors. Listening to the group, it seemed unanimous that everyone completely loved this sandwich. The sound of “oohs,” “ahhs,” and “mmm’s” reverberated around the table. 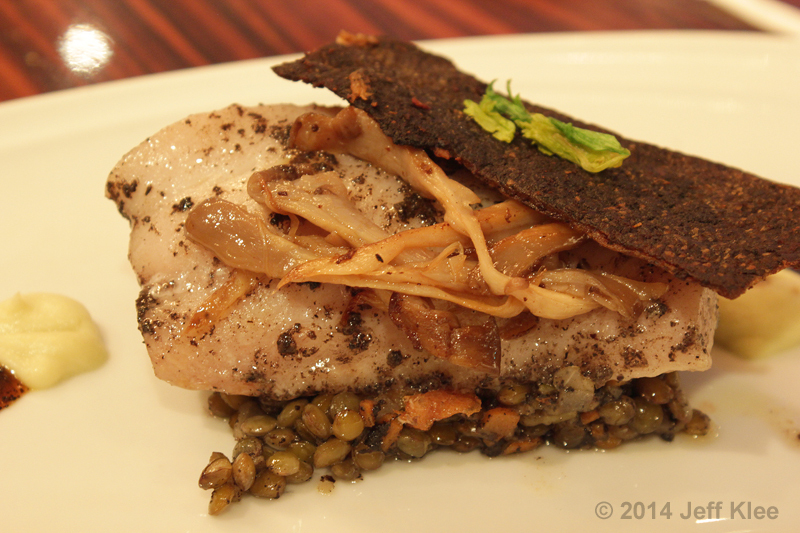 Our next course was a Pan Roasted Black Cod, with sautéed King Oyster mushrooms on a bed of baby green lentils. It included dabs of celery cream and a Madeira truffle reduction. It was served with a Famille Perrin, 2010 from Gigondas, Rhône. The cod was marinated with truffle and lemon juice before roasting, and it came out deliciously tender and flaky. Once again, this plate was talked about by many in the group. Many were initially worried about the cod being too fishy, but just like the seafood from our first two courses, it was instead fresh and flavorful. Since I’m not too fond of mushrooms, this part of the course didn’t impress me, but at the same time they weren’t too overpowering for me to feel the need to remove them. The fish was topped with it’s own skin, which had been fried until fully crisp and had a light taste of truffle. As Chef Lin Lam put it, “it’s like a slice of fish bacon.” This super crispy skin added a huge contrasting texture to the remaining ingredients. I have experienced a dish similar to this at Canoe restaurant in Atlanta. It’s an interesting technique using the fish skin, an ingredient that many times is just discarded. I definitely enjoyed trying a different version, and found it quite tasty. The lentils were cooked in crab juice with carrot, celery, and truffle. They had a semi-firm texture and added a complimenting flavor to the large serving of cod. 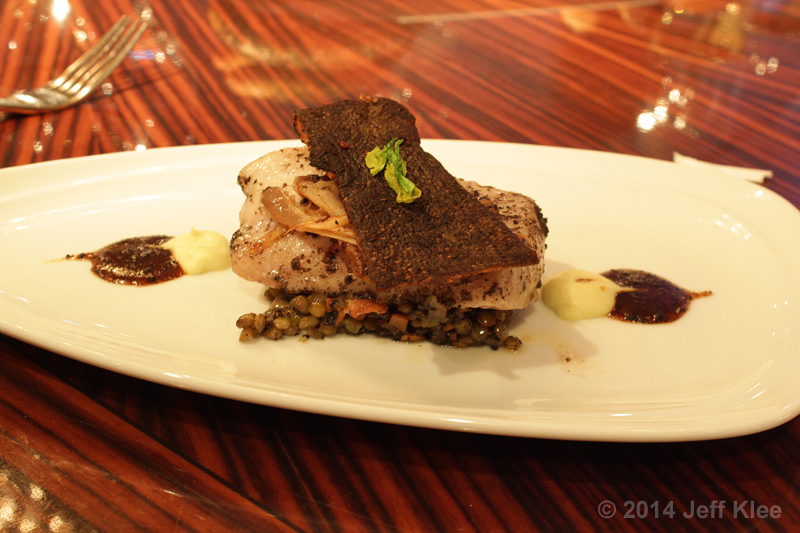 On each side of the fish were small samples of celery cream and a Madeira truffle reduction. The celery cream was made from celery root and celery stalk. The root is cooked in milk, the stalk in vegetable stock. Once they are both cooked, they are put together and puréed, at which time cream is added. This is then reduced down until it can be made into the mousse consistency seen on the plate. The Maderia reduction is made with Maderia wine, which is reduced with garlic and onion until it’s almost caramelized. Then truffle and demi-glace is added. The celery cream was not that interesting to me, and didn’t have a strong enough flavor to be noticed when mixed with the cod. The Maderia reduction on the other hand was a powerful flavor that was quite obvious. Chef Lin even stated how there was only a dab of the reduction for that very reason, otherwise you wouldn’t be able to taste anything else. It had a bite that was on the sweeter side, and complimented the slight sour and salty flavor that the cod brought to the table. I actually wish there had been more than just that small dab. 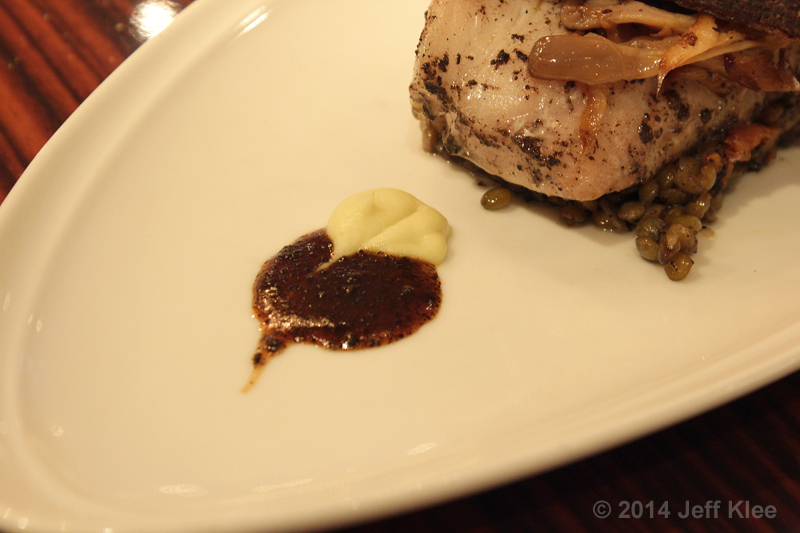 Overall, this was a well made dish with a lot of contrasting flavors and textures. 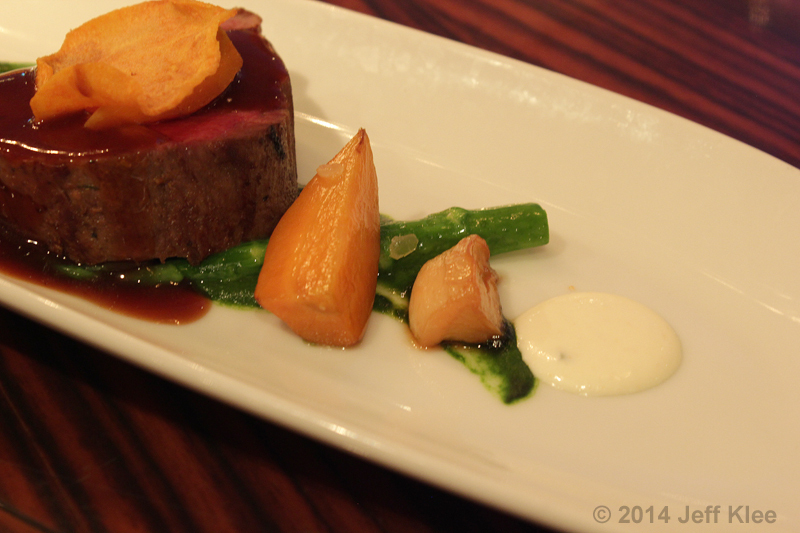 Our next course was a Seared Beef Tenderloin with horseradish cream, caramelized turnips, and spinach purée. 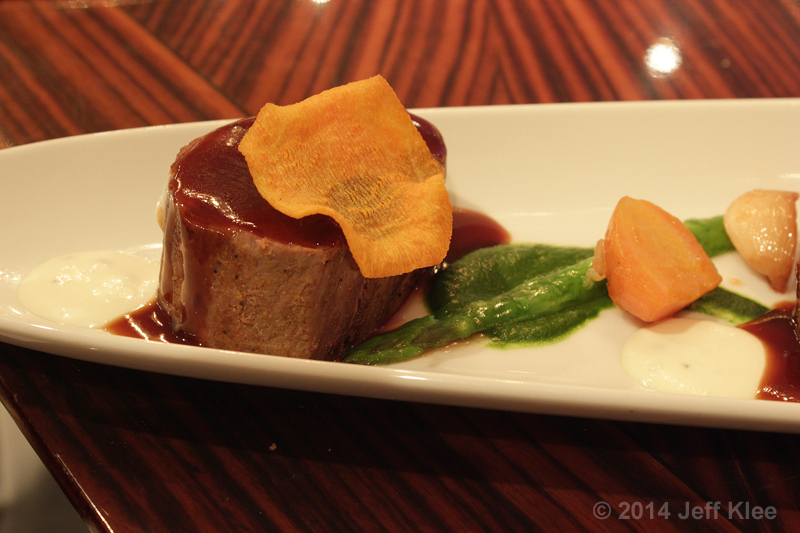 It was served with a Malbec 2011 from Salentein “Numina” Mendoza, Argentina. 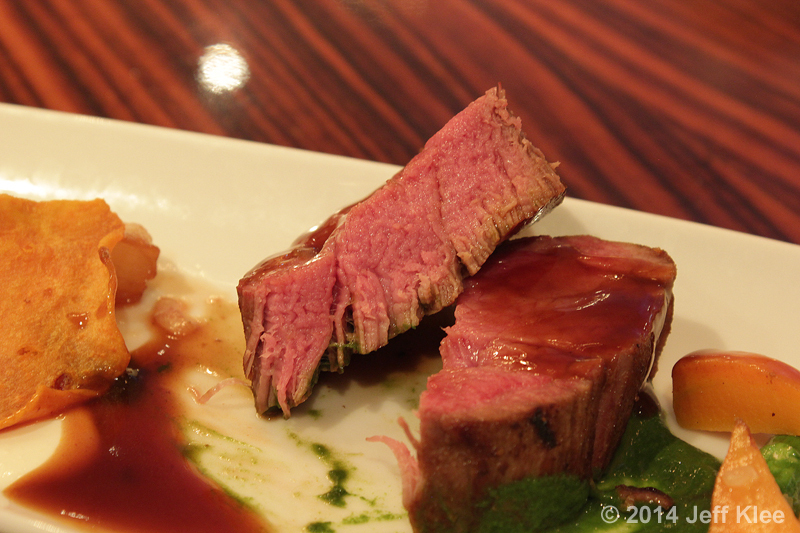 The main portion, the beef tenderloin, was cooked in the oven for an hour and a half at about 250°F. The tenderloins were covered in a port wine reduction, which was made by reducing port wine with thyme and rosemary until almost caramelized. Veal stock is added and it simmers for about 20 minutes until all the flavors come together. 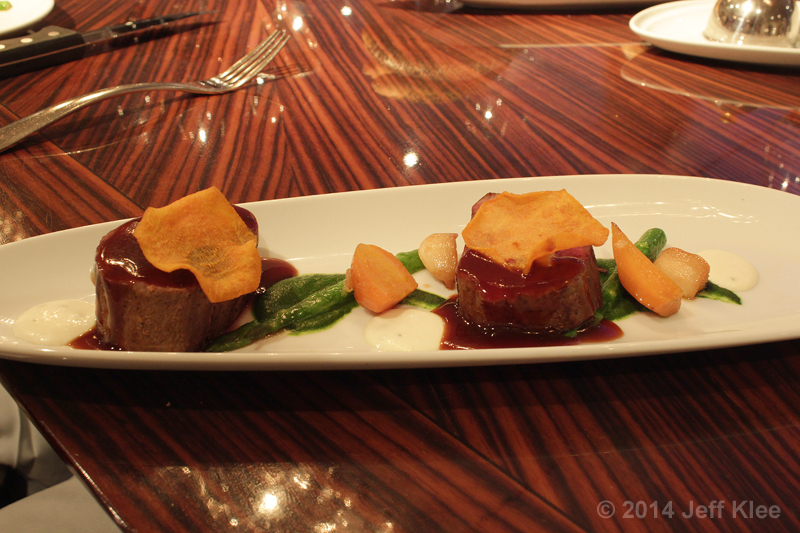 Each loin was then garnished with sweet potato chips. The beef was medium-rare, just the way I love it, and it was utterly perfect. Each was super tender and moist, and while there was limited flavor in the meat itself, the port wine reduction gave them all the sweet flavor they needed. The sweet potato chips were simply as named, but they gave just a hint of that contrasting crunch that always makes a meal pop. The vegetables were turnips and asparagus. They were both cooked until soft, especially the turnips which were caramelized with sugar and port wine. The asparagus sat in a spinach purée made with onion, garlic, spinach, and a little vegetable stock. I found the purée to not really have a lot of flavor. I preferred dipping the asparagus into the horseradish cream. This cream had a hint of heat that was perfect for my tastes. It was made with crème fraîche, lemon juice, chives, and horseradish. It was just the right spark for the asparagus, which isn’t one of my favored vegetables. The turnips were tasteful on their own from the caramelization process. I generally love any kind of tenderloin plate, but this one didn’t have my full interest. The beef itself was perfect. The meat, the reduction sauce, and the chips all worked in unison to provide a fantastically sweet flavor with varying textures. The rest of the plate was a bit flat to me. Without the horseradish cream, I think the vegetables would have been lacking any zip in flavor. Overall, it was still enjoyable, just not a plate that stood out during the dinner. Finally, it was time for dessert. 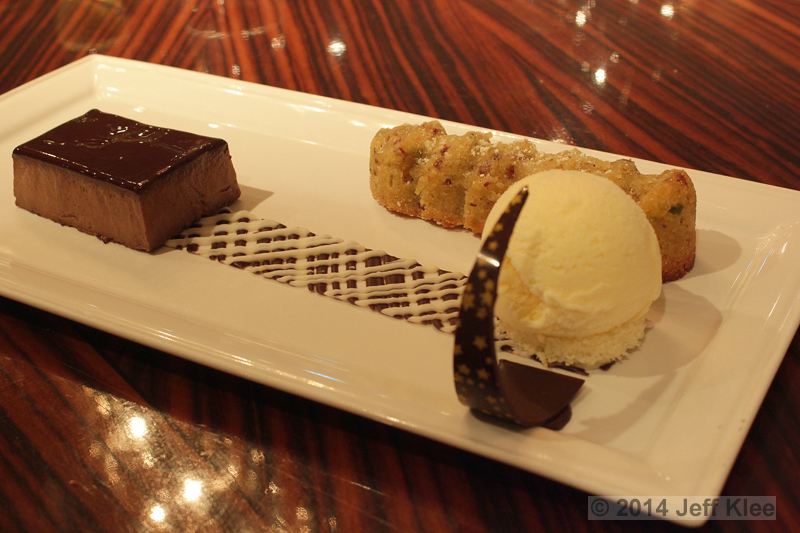 This course consisted of Chocolate Crème Brulée with Cherry Pistachio Financier and Homemade Vanilla Ice Cream. The paired drink was a Provincia Di Pavia, Moscato d’Asti from Piedmont, Italy. The crème brûlée was not the typical type that you’re used to seeing. Usually crème brûlée is a thick cream dish that has a sugar on top which is burned, creating a crispy crust. 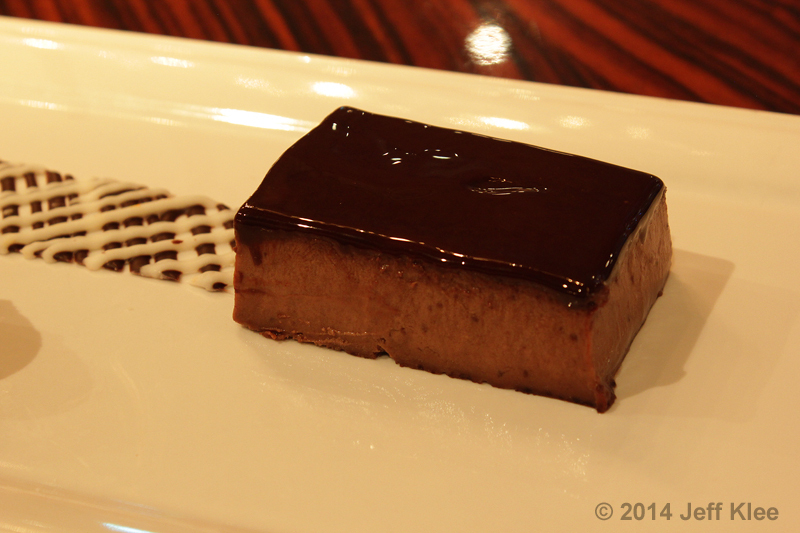 This one looked more like a block of mousse, and the creation process is completely different that usual. The dessert was created by cooking milk with sugar and vanilla. Once the sugar melts, the chef adds pasteurized egg yolk. It keeps getting whisked until the mixture becomes very smooth, then melted chocolate is added and the whole thing is set in the refrigerator. The shiny dark glaze on top is pure chocolate and cocoa syrup. Pure chocolate is melted down, which normally would be a flat color and not shiny as it is seen here. It would also turn very hard when cooled. To compensate for this, they heat it up to 200°F, then cool it to 100°F. Finally it’s reheated to 175°F. This process keeps the chocolate shiny and it won’t lose its color. The cocoa syrup is added to keep it soft after refrigeration. The financier was a small bar cake made from condensed cream, sugar, almond paste, almond flour, and orange zest. This one also had some cherry added for a fruity flavor. It’s cooked in the oven for 30 minutes at 350°F. 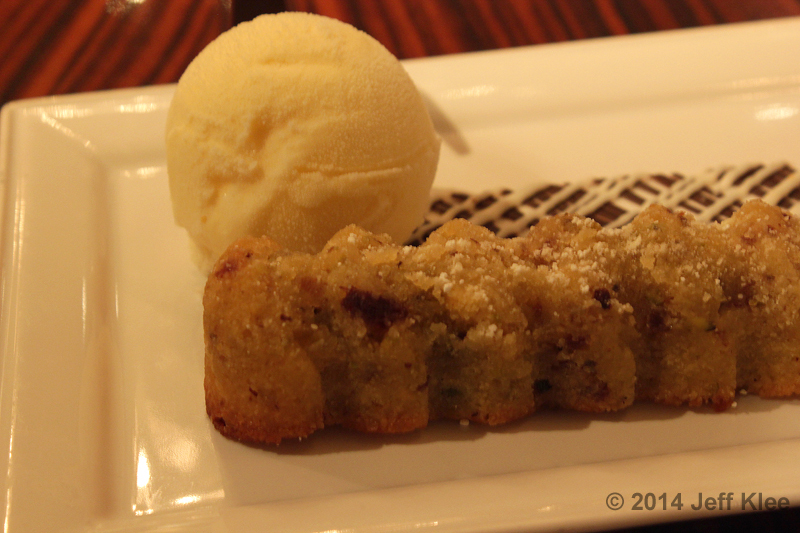 The financier had a full nutty flavor and a hint of orange from the zest. I personally didn’t notice the cherry flavor that had been added. Many at the table were pleasantly surprised by the taste of almond that the dessert had. Myself on the other hand, with my wife’s gluten sensitivity, I’ve had a lot of experience with products made from almond flour. I am very used to this flavor, especially since we find a lot of marzipan desserts at our favorite local bakery, City Cafe. As familiar as I am with the taste, it was still very well made, and tasted great. Normally cakes are slightly drier in nature, but we were told that this was not, since it was made with almond flour and paste. I agree that it was indeed very moist as these marzipan type desserts usually are. I was happy to find that most of the guests loved this unknowingly (to them) gluten-free item. If more people could try these types of desserts, maybe more gluten-free foods will show up in bakeries as people realize they’re actually tasty. The ice cream was nothing but a basic vanilla. It did go nicely with the other two desserts. 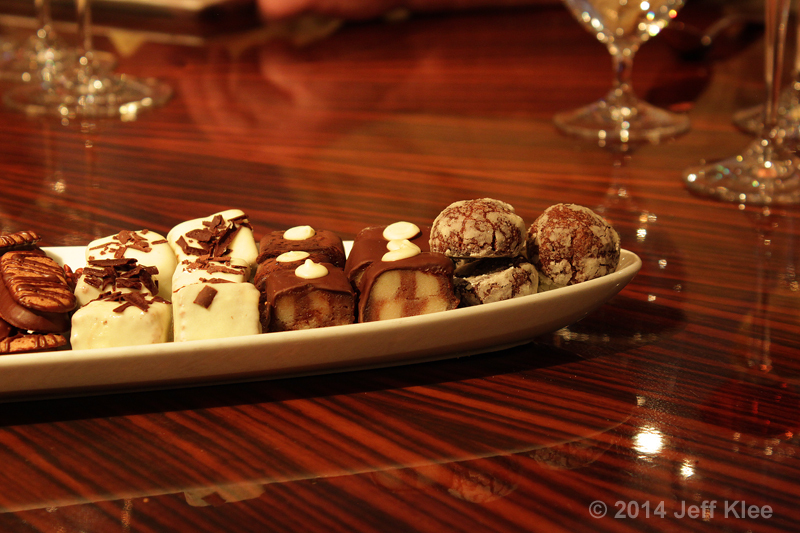 It also included a couple interestingly shaped fondant pieces to complete the presentation. As the meal came to a close, I knew there was one more thing on its way to the table. My dining companions were a little shocked to see even more food, as they were quite full from the five courses already presented. I, on the other hand, with my large appetite, looked forward to the mixed dessert platter that was soon placed in front of me. This platter was not meant to be a presented course with an explanation, but rather something for everyone to nibble on while dinner conversations came to a close. It included various types of small cookies of a one or two bite size. Just like the last time I ate at Chef’s Table, I had the majority of this platter to myself since everyone else had eaten about as much as they could for the night. Once again, Chef’s Table didn’t disappoint. It’s not just about the food quality with this dinner, although most everyone usually enjoys just about everything they eat. This dinner is about the intimate setting, the presentation and explanation of each item, specifically presented by the chef himself. It’s about the wine pairings and the explanations of where they come from and why they are the choices included with each course. Most of all, it’s the enjoyment of meeting new people, getting to know them, and having conversations with these new friends as you dine at a private table with one heck of a view. If the $85 cost makes you hesitant, when broken down you’ll find it’s actually a really good value, assuming you have an interest for everything included. At the end of the meal you receive the current cruise cookbook that is being presented all over the ship. During this cruise, it was the176 page Carte du Jour: The Restaurants of Royal Caribbean International, which was being sold on board for $35. 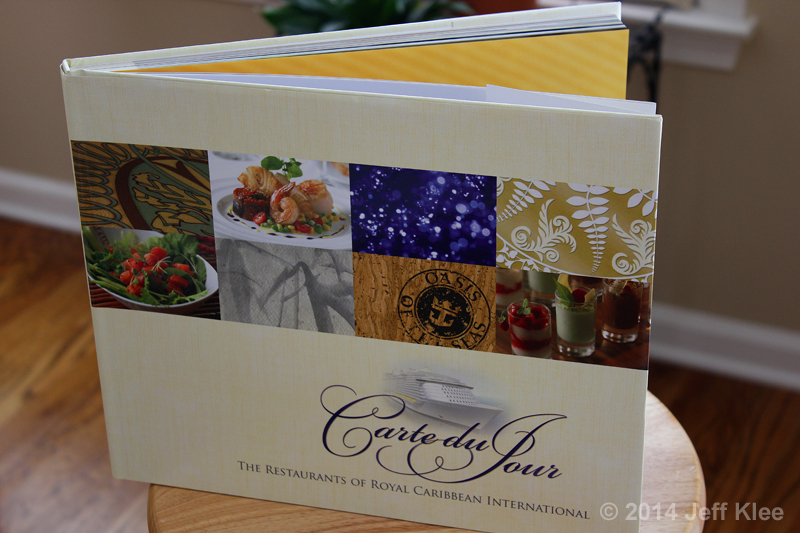 It gives photos and recipes of many of the favorite foods served on Royal Caribbean ships. Each glass of wine in the pairing was probably a little less than a normal full glass, but definitely larger than a flight. 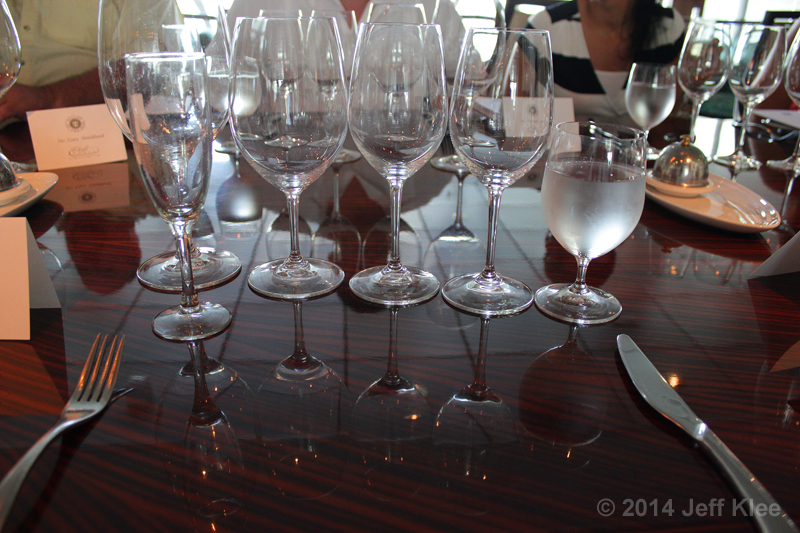 If the average glass of wine on the ship is about $8, and we say the pairing glasses are about three quarters that amount, let’s price them at $6 each. Including the initial glass of Champagne, we had six drinks, totaling $36. Now you’ve gotten a $35 book and $36 worth of drinks, totaling $71. That means the meal itself is only $14! It really is a great value if you have in interest in the cookbook and you enjoy wine paired with your meals. For those that have no interest in the wine (or alcohol in general), I was offered the opportunity to substitute some non-alcoholic mixed drinks instead. While they may not have connected with the food in any way, I found the couple I had to be delicious. 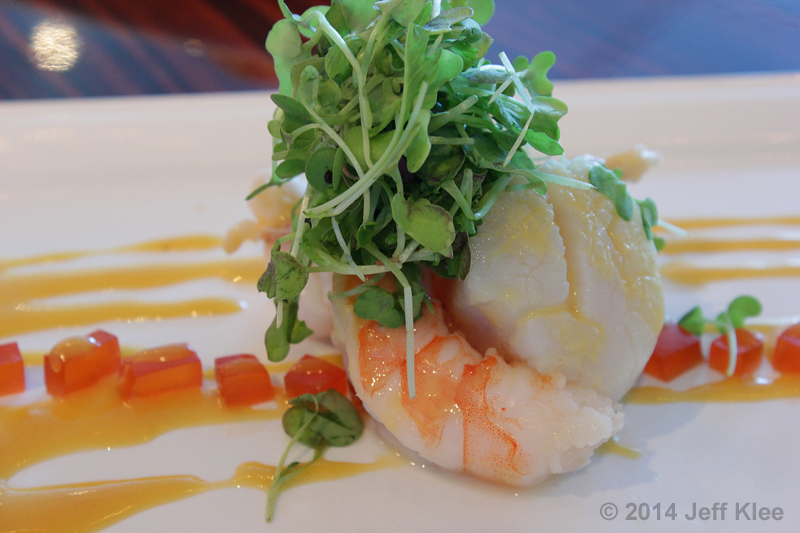 If you enjoy fine dining, and you enjoy meeting new people on cruises, this is a must try meal. It’s one heck of an experience, and not something you’ll soon forget. Note: I didn't include the wine pairing details for a couple reasons. First, I didn't participate, so I wouldn't be able to give my personal opinion on how the wine worked with the food to create the total experience. Second, up until this point, I have only reviewed food and atmosphere. I don't know if readers here are interested in the details of the pairings. If enough people mention an interest in learning the details of the pairings, I can provide ours with some detail, as I took plenty of notes from the sommelier as well. Thanks for this great review Jeff. I would agree with your assessment of the meal. It was a pleasure meeting you! I love your site, it has nice articles, Thanks!